Bioplastics, easily degraded plastics made from renewable biopolymers such as starch and protein, are being studied as possible substitute for synthetic plastics. One of Indonesian natural resources, Jicama (Pachyrizous erosus), also known as yam bean, is believed to have the potential to be made as bioplastics. This study aims to develop starch-based biofilms made from Jicama. The films were fabricated by using the solution casting method, with varying contents of water (67–93 wt%) and sodium hydroxide (0.3–0.7 g). Examinations were carried out by means of visual inspection, tensile test, scanning electron microscopy and FTIR spectroscopy. A continuous bioplastic film was successfully made with 93 wt.% water. The addition of water increased film formability. Sodium hydroxide improved the film formability but, also, induced fragility. The highest tensile strength and stiffness of 11.5 MPa and 0.98 GPa, respectively were achieved from the film prepared with 93 wt% water. These values are comparable to LDPE but with a lower ductility. Concerns were raised about the harmful environmental impacts caused by using and disposing non–renewable petroleum–based synthetic plastics. These types of plastics are considered to be non–biodegradable since they need a very long time to be degraded naturally by the environment and will remain exist for centuries. They are commonly used as packaging material for diverse consumer products, such as beverages and foods, and, thus, are used in enormous quantities. It is estimated that, in 2016, the production volume of synthetic plastics increased globally by 3.5% to 322 megatons. Also, the demand for synthetic plastic will continue to grow rapidly worldwide (Plastic Europe, 2016). Manufacturing of the synthetic plastics require high consumptions of energy and carbon emissions (Campilho, 2016). Therefore, the accumulation of synthetic plastics may cause environmental pollution. Ultimately, this promotes a growing interest in the application of renewable bioplastics as a possible substitute for synthetic plastics. Bioplastics are plastics made from biopolymers, such as starch and protein, which are degraded easily. Starch is considered to be one of the most promising materials to be made as bioplastics since it is sustainable, natural, biodegradable and abundant. From an environmental standpoint, the production starch can reduce the consumption of energy by up to 82 MJ/kg and CO2 emissions by 6.8 CO2e/kg (Campilho, 2016). Another study showed biopolymer enabled savings of ~20% of energy and CO2 emissions (Mohanty et al., 2005). Starch can be found in most plants such as maize, rice (paddy), wheat, potatoes, cassava, bananas, yams, and sorghum (Carvalho, 2008). Typically, yams grow relatively quickly, i.e. for eight to ten months. One type of yam, i.e. yam bean, is widely available and particularly in Indonesia. Starch has two main polymeric constituents; these are amylose in which the glucose units are linked together in straight chains and amylopectin in which the glucose chains are highly branched (Sam et al., 2016). 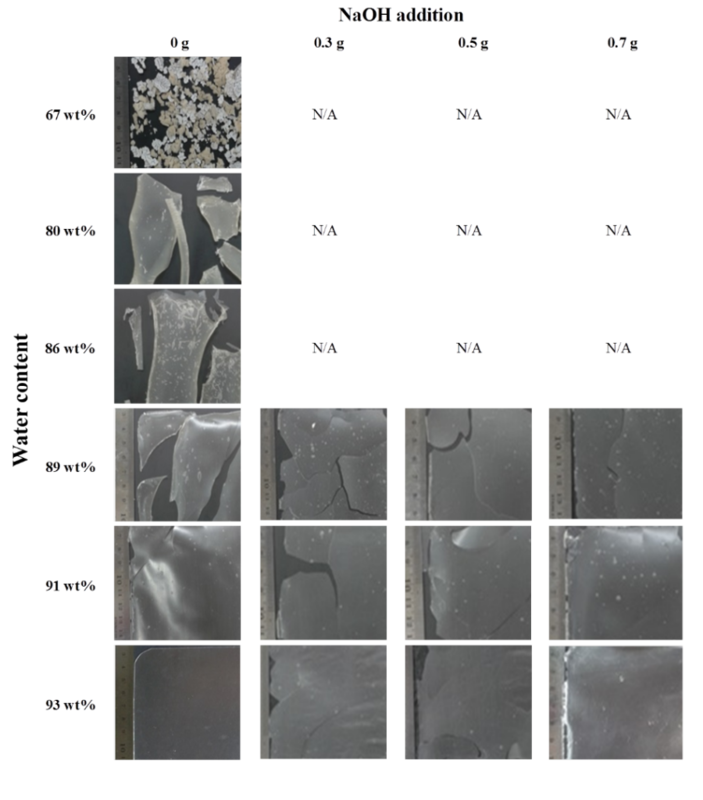 In starch, the amylose content is particularly important for producing strong film-forming properties, as demonstrated in a study of high-amylose rice and pea starch films (Mehyar & Han, 2004). Another research group reported that the starch from yam bean contained 23% amylose (Mélo et al., 2003). This is comparable to the amylose content found in other starch materials that are commonly used for bioplastics, i.e. corn starch (25±2%), and in cassava starch (19±2%) (Mali et al., 2006). Hence, it is believed that yam bean starch may have the potential to be used as an alternative tropical renewable resource to fabric bioplastic material. For this reason, this study aims to prepare starch-based bioplastic films made from yam bean (Pachyrizous erosus). Further, the addition of sodium hydroxide to yam bean starch bioplastics was studied, also, in this work in an attempt to improve the film-forming properties. This is one of the strategies that has been directed to improve the physical and chemical properties of starchy materials, i.e. rice starch (Rachtanapun et al., 2012) and several cereal starches (Lai et al., 2002). The starch, used in this study, was isolated from yam bean tuber. The additive used was a commercially available solid sodium hydroxide. The starch was extracted by using the filtration method. The bioplastic films were prepared by using the solution casting method with different concentrations of water from 67 to 93 wt.% and sodium hydroxides from 0.3 to 0.7 g. The weight percentages of water were calculated with respect to the total weight of dry starch and water. The sample nomenclature was referenced according to the water and NaOH contents, i.e. W x – Na y for a bioplastic film with x wt.% water and y g NaOH. All films were made with a constant amount of 10 g of dry yam bean starch. The yam bean starch bioplastic, made only with water, was characterized by means of the Fourier Transform Infrared Spectroscopy (FTIR). The FTIR spectra were recorded on a Prestige 21 spectrometer (Shimadzu Corp., Kyoto, Japan) with 4 cm-1 resolution. Formability of the bioplastics was observed by visual inspection. Scanning Electron Microscopy (SEM) was used to investigate the morphology of the produced bioplastic films. Tensile tests were carried out according to ASTM D-882-02 for thin film with a thickness of 0.1 mm. Tensile properties were measured by using a Tensilon RTF-1310 (A&D Co., Ltd., Tokyo, Japan) equipped with a 1 kN load cell with a 10-cm gage length at a crosshead speed of 5 mm/min. A continuous bioplastic film was successfully made with 93 wt.% water. The addition of water increased the bioplastics’ formability. Sodium hydroxide also improved the formability but induced fragility. The highest tensile strength and stiffness of 11.5 MPa and 0.98 GPa, respectively, were achieved from the bioplastic film with 93 wt.% water. While, the highest ductility of 2.44% was obtained from the bioplastic with 93 wt.% water and the addition of 0.7 g NaOH. The obtained strength and stiffness were higher when compared to that of LDPE but with a much lower ductility; this was more comparable to other starch-based bioplastics.